Lori Early has been on staff at Warsaw Community Church for the last seven years, and has served as the Connections Coordinator for the last two. Warsaw launched in 1993 and is currently a church of 2000 people meeting in two locations in northern Indiana. WCC offers a relaxed, grace-filled environment with contemporary worship and relevant teaching whose doors are wide open to people from all backgrounds, regardless of where they are on their spiritual journey. Get in touch with Lori via email. How is your Guest Services team structured? 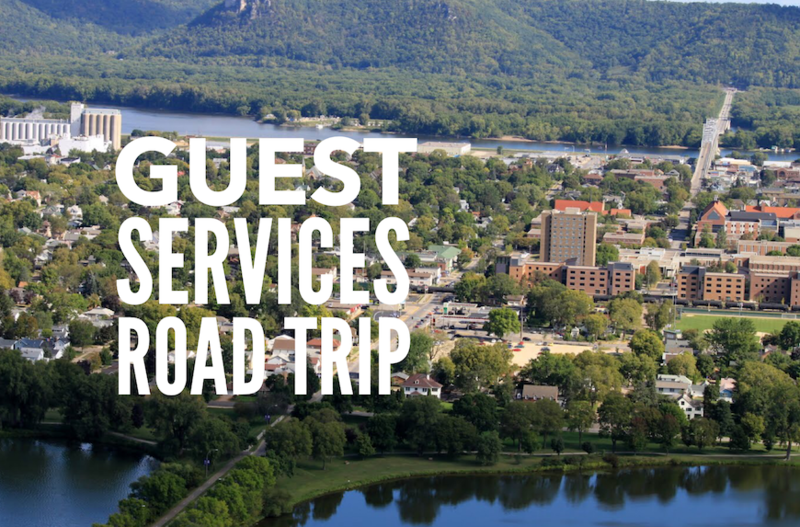 Do you ever release guest services volunteers to lead in other ministries? I see our website as the first step in the assimilation process, so I am working closely with our Communications department to make it user-friendly for first time guests. The first time on-campus experience is the next step. We want people to have the best experience possible and I think we do a good job with that. Our connection card would be the third step, and we currently have multiple ways for that to happen. Cards are at the auditorium entrance, and guests are encouraged by our lobby and Quarter-After hosts, the Info center, and the service hosts to fill that out . We have paper, app, and online versions of the connection card. On Monday, we send a hand-written card to all new guests who have identified themselves through a connection card, or by checking a child into our children’s program. On Thursday, we send a Connection email outlining our new guest opportunities – The Quarter-After, Discovery Series class, and upcoming connection event. Our Discovery Series class, much like church membership classes, is three Sunday sessions during our 10:45am service that give a new guest a closer look at WCC, help them identify their spiritual gifts, and discover the many ways to get connected at the church. We point them to growth, serving, Biblical community, and mission opportunities. Our quarterly connection events are meant to create opportunities for our newer guests to connect with each other and with other well-connected, active people within the church. These steps complete the current process. Our hope is this will assist our guests in getting assimilated more quickly. For many years we have operated in the “silo mentality” but we are on our way out of that thought process. Over the last two years I have met with each ministry to share the assimilation vision and process. Many are coming onboard by including me in the planning of their ministry events and by sending me any new guests who enter our church through their ministry, which enables me to follow up and start them in our connections assimilation process. Professionally speaking, a successful weekend is when members of our teams are able to connect with a guest, new or old, at a deeper level than a mere “hello.” If we’ve been able to give information that gets a person further along their spiritual path…if we’ve been able to gather information that helps us know our guest better…if we’ve had the privilege of listening to someone’s story or pray with them…all those scenarios define success. And at the same time, I want to have done those things for my team members. I believe God is challenging us to change our pre-service auditorium culture. I’m currently reading Thom Ranier’s newest book, Becoming A Welcoming Church. In chapter one, Thom asks the question, “Are we as welcoming as we think we are?” I’m sensing that God wants us to move beyond friendly to opening our hearts to the idea of spilling forth the fruit of kindness. In a recent Bible study I attended, kindness was defined as caring about a person’s needs enough to respond. Kindness involves sacrifice. As with many of the changes I have implemented, I plan to share my vision with key, non-staff people in our church. I’m proposing they enter the auditorium five or ten minutes before the service starts, head to their seating area (we all like to sit in the same place), and build relationships with those who sit around them. Much like “the wave” at a football game, if God’s in this, it will pick up momentum. My vision is that our auditorium will be filled with the buzz of conversation and laughter much like our lobby is on a Sunday. The difference, the lobby is buzzing with groups of people who already know each other, but the auditorium could become the place where new relationships are formed.